Parlsey, Sage, Rosemary and TIME began with a vintage fur clip. Too interesting to throw away, but patinaed with age and not in good enough shape to be used as is. It had some lovely large deep aqua rhinestones which I knew would match some other beads and flatbacks I already had. Staying with the floral theme suggested by the clip proved to be more difficult than I expected! I auditioned quite a few charms, found objects, and broken bits before the broken watch pieces caught my eye. Here was the answer! The watch parts were also worn and stained with time, like the clip. Juxtaposing those parts with some sparkly flatback acrylic "stones" would echo the stain and sparkle of the clip. Maybe you have a piece like my fur clip, just begging to be given new life as the focal piece of a treasure necklace. You don't have to make your necklace as massive as mine turned out. In fact, I'll warn you ~ this piece is heavy! So please feel free to scale back, or even up if you are brave enough, or if you have really strong neck muscles! Here are the basic steps that I took to create Parsley, Sage, Rosemary and TIME necklace shown above. With a few modifications, the instructions can easily be adapted to any themed set of treasures you wish to use. Roll out polymer clay into the base shape of your choice. Poke holes through it and bake according to the brand's directions. Make your holes big enough to accomodate seed beads, and don't forget to add some at the top for the neckstrap! Sew seed bead and crystal fringe to the bottom through the holes. Run seed beads through the holes themselves to prevent the rough clay from fraying the thread. Although I didn't string the neckstraps right away, I wanted to get the wires in place now so that it wouldn't be difficult to find the holes later after all the bits 'n bobs were added. String some seedbeads on beading wire both in front of and in back of the hole, and crimp the two strands together. You'll bury the short end later. On this necklace, I chose to have two strands on each side to help hold the piece securely and not put too much weight on each strand. The long end of each of my strands was about 12 inches, left to be beaded later. Plan out your mini-assemblage. It may help to trace the shape on paper and move the items about, marking their spots when you are satisfied. Then you can transfer them and glue them to the base. Mix up your epoxy or uncap your E6000. Use good ventilation and glue your pieces to the backing. Remember to build in layers from the bottom up. Add any glitter or pearlex or paints you desire. Bead up the neckstrands, crimping at strategic points if needed for the weight. Crimp around a chain and the clasp of your choice. 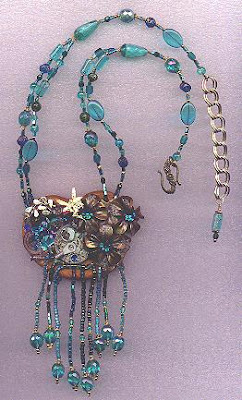 I like to wire a beaded dangle to the end of the chain. Choose a hook or clasp big enough to balance the size of your necklace. Copyright 2004 Cyndi Lavin. Not to be reprinted, resold, or redistributed for profit. May be printed out for personal use or distributed electronically provided that entire file, including this notice, remains intact.